Ketchup is a kind of thick, liquid sauce. It is made from tomatoes, so it is sometimes called tomato sauce. Usually it is used to add flavour to food. Some people like to eat sausages, burgers, hotdogs or fishsticks with ketchup. Ketchup tastes very unlike the real tomato. Although today's ketchup is tomato based, it did not appear until about a century after other types. By 1801, a recipe for tomato ketchup was created by Sandy Addison. It was later printed in an American cookbook, the Sugar House Book. James Mease published another recipe in 1812. In 1824, a ketchup recipe using tomatoes appeared in The Virginia Housewife. This was an important 19th-century cookbook written by Mary Randolph, Thomas Jefferson's cousin. As the century went on, ketchup became more popular in the United States. More Americans began to like tomatoes. 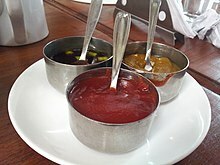 Tomato ketchup was sold locally by farmers. A man named Jonas Yerks (or Yerkes) is believed to have been the first man to make tomato ketchup a national phenomenon. By 1837, he had produced and distributed the condiment nationally. Shortly after that, other companies did the same. F. & J. Heinz created their tomato ketchup in 1876. Heinz tomato ketchup was advertised: "Blessed relief for Mother and the other women in the household!" The Webster's Dictionary of 1913 defined "catchup" as a "table sauce made from mushrooms, tomatoes, walnuts, etc. [Written also ketchup]." Modern ketchup emerged in the early years of the 20th century. This came from a debate over the use of sodium benzoate as a preservative in condiments. Harvey W. Wiley challenged the safety of benzoate. In response, business owners, particularly Henry J. Heinz, pursued a different recipe that did not use that preservative. A bottle of Geo. Watkins mushroom ketchup. Prior to Heinz (and his fellow innovators), commercial tomato ketchups of that time were watery and thin. This was due to the use of unripe tomatoes. Those tomatoes were low in pectin. They were less vinegary than modern ketchups. By pickling ripe tomatoes, the need for benzoate was eliminated. There was also no spoiled ketchup or loss in flavor. The changes also helped make it an important American condiment according to some experts. Until Heinz, most commercial ketchups appealed to two of the basic tastes: bitterness and saltiness. But the switch to ripe tomatoes and more tomato solids added a stronger umami taste. The major increase in the concentration of vinegar added sourness and pungency to the range of sensations experienced while eating it. In the past, ketchup was produced from fresh tomatoes after harvesting. Vacuum evaporation made it possible to turn tomatoes into a very thick tomato paste. This made it easy to store at room temperature. This allows a factory to produce ketchup throughout the year. A packet of ketchup, opened. In fast food chains, ketchup is often put in small packets that hold ketchup inside. Users tear the side or top of the packet. They then squeeze the ketchup out of the ketchup packets. In 2010, Heinz is offering an alternate squeeze and dip cup. This is meant to offer a cleaner method of dispensing the product. In an earlier approach, some fast food outlets dispense ketchup from pumps into paper cups. Some restaurants still use this method. In October 2000, Heinz introduced colored ketchup products called EZ Squirt. They included green, purple, pink, orange, teal, and blue colored ketchup. These products were made by adding food coloring to the traditional ketchup. As of January 2006[update] these products have been discontinued. ↑ Taken from "The Sugar House Book", 1801. Get [the tomatoes] quite ripe on a dry day, squeeze them with your hands till reduced to a pulp, then put half a pound of fine salt to one hundred tomatoes, and boil them for two hours. Stir them to prevent burning. While hot press them through a fine sieve, with a silver spoon till nought but the skin remains, then add a little mace, 3 nutmegs, allspice, cloves, cinnamon, ginger, and pepper to taste. Boil over a slow fire till quite thick, stir all the time. The salt in this recipe, which served as a preservative, gives it a very salty taste. This recipe is important because tomato was not widely accepted by people in North America in the early 1800s. Many believed it was poisonous. ↑ Andrew F. Smith (2001). The Tomato in America: Early History, Culture, and Cookery. University of Illinois Press. ISBN 978-0-252-07009-9. ↑ Associated Press (April 7, 2003). "Heinz unveils new blue ketchup". This page was last changed on 31 January 2018, at 08:19.